Strawberry Swing and other things: [Recipe Share] Sweet Potato Bean Burritos! I found this recipe on Lindsay's "Being Suzy Homemaker" blog. It's right up my pescatarian alley and super healthy. While it doesn't sound like it'd be a good combination, the flavors really work well together and it's a dish the Husband and I have decided will go into heavy rotation. It's healthy, it's cheap, and it's great for leftovers - WIN! 2. In a large bowl, combine the black beans and kidney beans and roughly mash. 3. Heat butter in a medium saucepan and saute onion and garlic until soft. Stir in beans and gradually stir in water -- you want them to be thick still and not too runny so you might not need as much as 2 cups of water. 4. Remove bean mixture from heat and stir in chili powder, cumin, mustard, cayenne pepper and soy sauce. 5. Warm stack of tortillas in the microwave for 45 seconds to make pliable. 6. 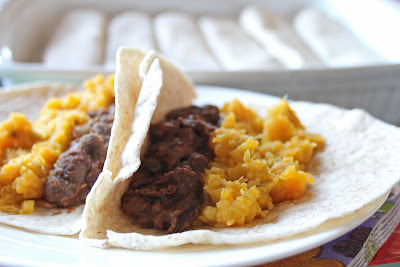 Divide bean mixture and mashed sweet potatoes evenly between tortillas. Top with cheese and roll tortilla and place seam side down in a baking pan. This made enough servings for 3 nights! I think next time around, we'll probably cut the recipe in half, but definitely try it out if you're looking for something new (and easy!). Oh yum...we used to make these quite a bit... have to get them back in rotation. I do remember that they freeze very well (baked minus the cheese on top and then wrapped individually in wax paper/foil before putting in freezer bag) and were great to reheat for lunches. Oh, it's rare when I eat a burrito and there's NOT sweet potatoes in it! I am obsessed with sweet potatoes. In fact, no lie...I'm having a black bean and sweet potato quesadilla tonight! If you like tomatillos, you should totally try putting some salsa verde on your burrito next time you make it! The flavors are PERFECT together! This is right up my alley with beans and sweet potatoes! Looks like we'll have to make it asap! Glad you liked the burritos!! They are absolutely one of our staple recipes and I'm sure couldn't be any healthier. Thanks for sharing it! MichelleM - Thanks for the tip, we'll do that next time because we'd love to make these to leftovers that can be packed as lunch! AppGal - mmmm I LOVE (seriously LOVE) salsa verde and we have a whole jar of it. Thanks for the idea! Andi & Natasha - Thanks Ladies! Lindsay - Thank *you* for the recipe... so simple, but complex in taste at the same time... we love it!